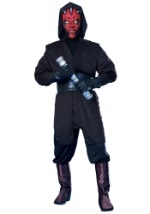 This deluxe Emperor Palpatine EP 3 costume is a unique, authentic adult Star Wars costume. The costume includes a hooded maroon robe made out of a mixture of polyester and velvet. The robe secures together behind the neck. The finishing touches are an intricately decorated attached chest piece and a three-quarter latex mask with detailed features made to resemble those of Palpatine.